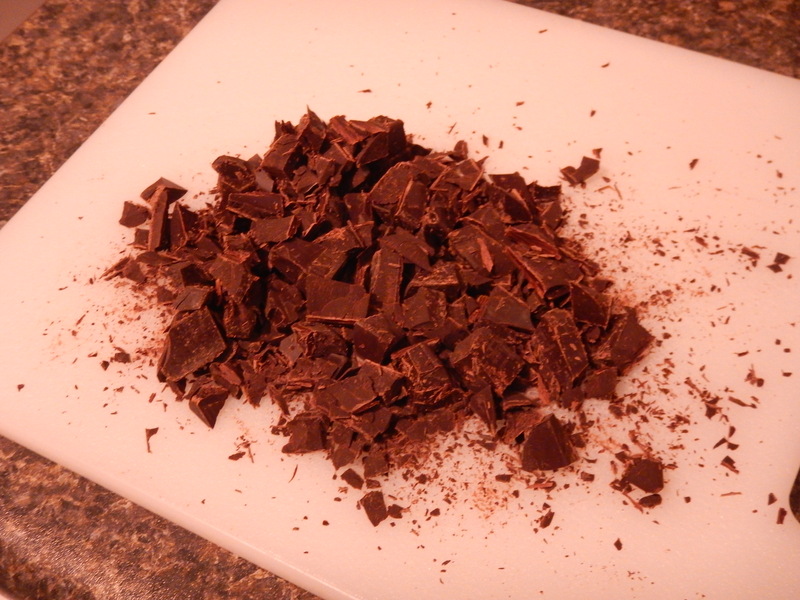 What do you do when you have a whole bunch of unsweetened dark chocolate left over from a recipe? Why not try your hand at making a traditional Mexican hot chocolate that will blow your mind in the flavour department? Yep! This recipe is a keeper! I used 4 squares of the dark stuff for this recipe. I could have used less, but I was going for traditional flavours of the deep, rich hot chocolate I once had when I was in Oaxaca, Mexico. and then melted it all into a pot on the stove. 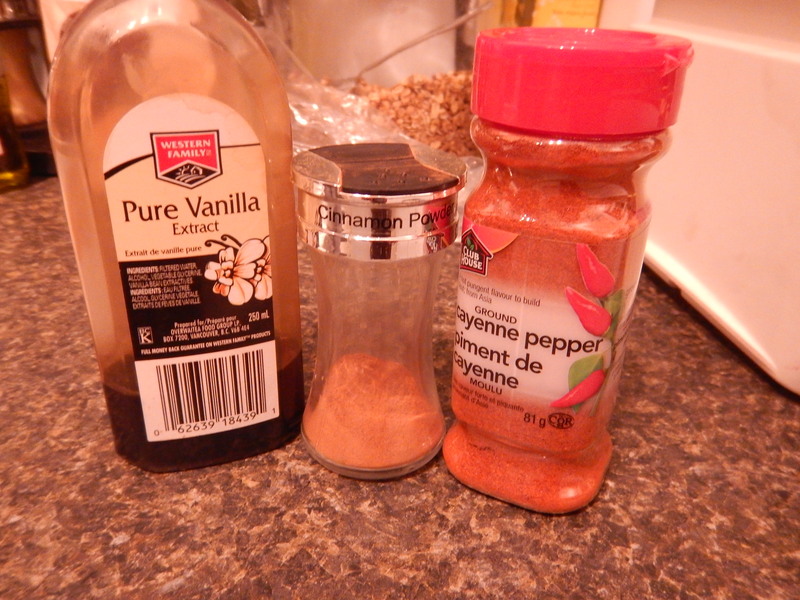 For spices, I opted for classic cinnamon, vanilla and a dash of cayenne pepper, which left a pleasant lingering heat in the back of your throat. Don’t forget to sweeten your tasty brew! You’ll know it’s ready once it’s all melty and steaming hot. 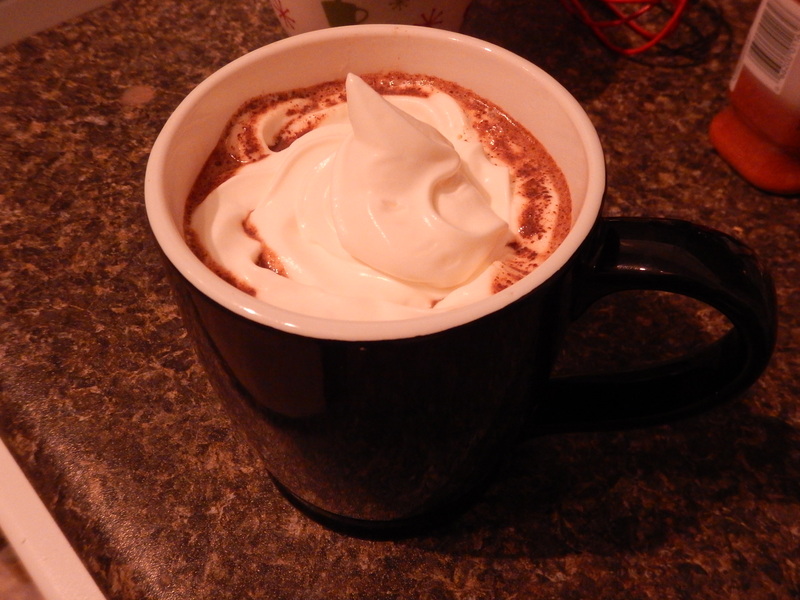 Pour into a large mug… and top with a dollop of whip cream for an extra decadent treat on a cold winter’s night. (optional) Whip cream, to top. 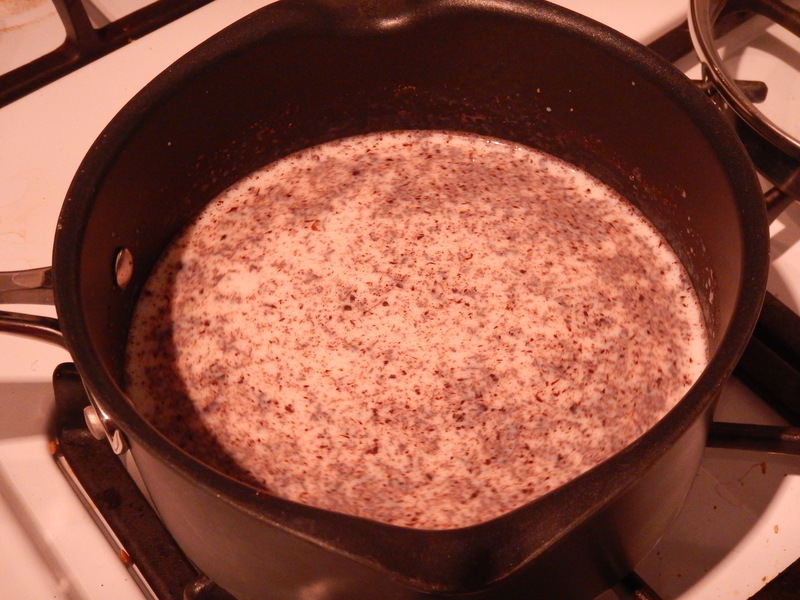 Pour milk into a pot and heat on medium-low until steaming. 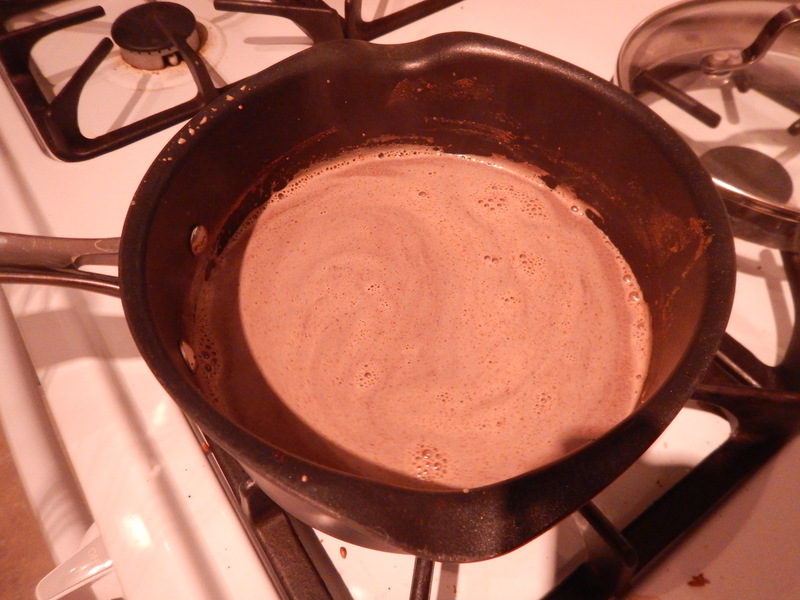 Roughly chop the chocolate and melt into the milk, whisking every so often. Add spices and sweeten to taste. 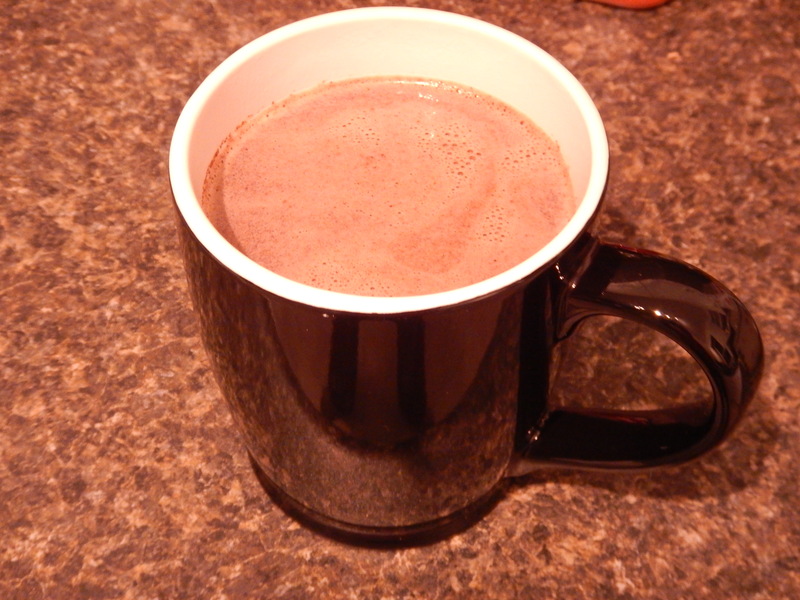 Pour into a large mug and top with whip cream, if using. Enjoy (a lot!) on a cold winter’s night. So here we are: blog post number 200! I honestly can’t quite believe that I’ve been on this epic food journey for the past four years, and have written 200 posts. This is going to be a retrospective post today, as I feel that with important milestones, it is really important to take a step back and reflect on all that’s been created. Since my 100th blog post, so much has changed! Justin and I got married in June of 2012, we bought our first home in Parkallen, renovated it, and are now living happily and comfortably in our lovely abode. With the new kitchen came a new blog name. Also since that 100th’s blog post, I’ve decided to change careers, went back to school to learn how to take on that career, and starting working in an a dynamic and down-to-earth organization. Life continues to change for us over here at Parkallen Home Kitchen. I’m starting a new job in January, and I’m sure that life will continue to throw us curve balls along the way! When it comes to the kitchen, however, my philosophies remain the same: I still endeavour to use as many local ingredients as possible in my recipes. I have slipped up a few times on that front, but I am realizing that when life is busy, it’s sometimes tough to make it out to the market. Over the past two years, I’ve learned to truly appreciate my heritage and explored some traditional French Canadian recipes, including Tourtiere, Cretons, Tarte au Sucre and Soupe au Pois (Pea Soup). As part of Ukranian heritage, I explored making homemade perogies with my Baba, (that post now has an incredible 16,870 views!). 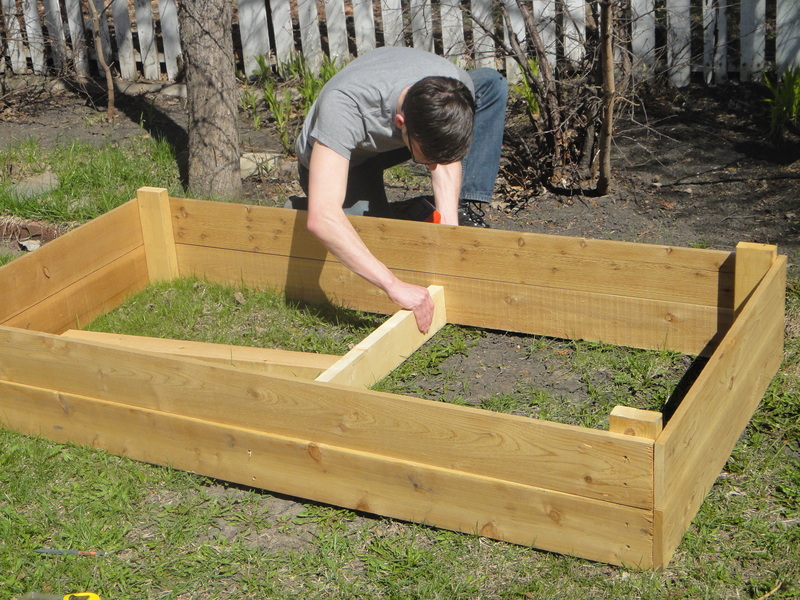 Justin and I learned how to juice the apples from our yard for the first time, and we undertook our first adventures in vegetable seeding and box-gardening this past summer. They both turned out extremely well! 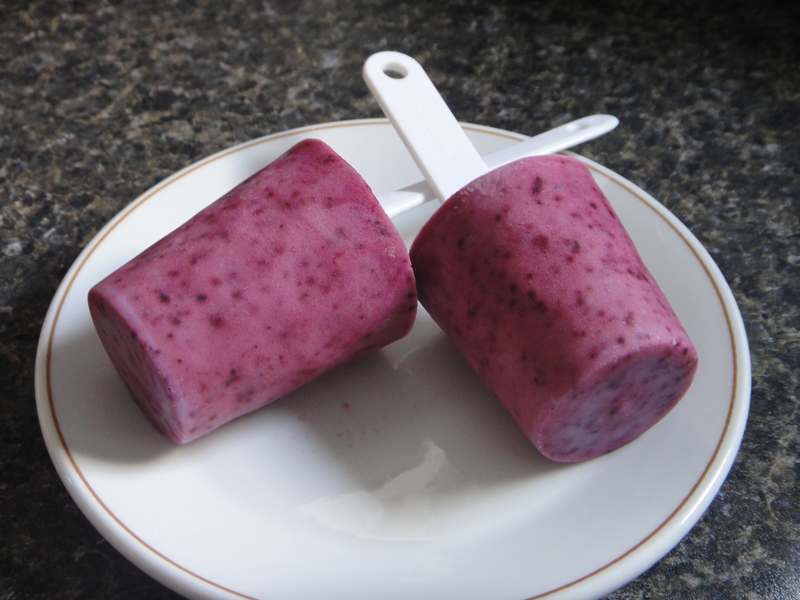 The Blueberry Coconut Popsicles I made last summer were a huge hit! As were the Grainy Chicken Fingers with Lemon Dilly Dipping Sauce (Oh boy – I have to make those again soon!). Justin’s new favourite ice cream recipe is coconut, thanks to the amazing recipe I concocted, and his favourite recipe, by far, that I’ve ever made him is Taco Pie. 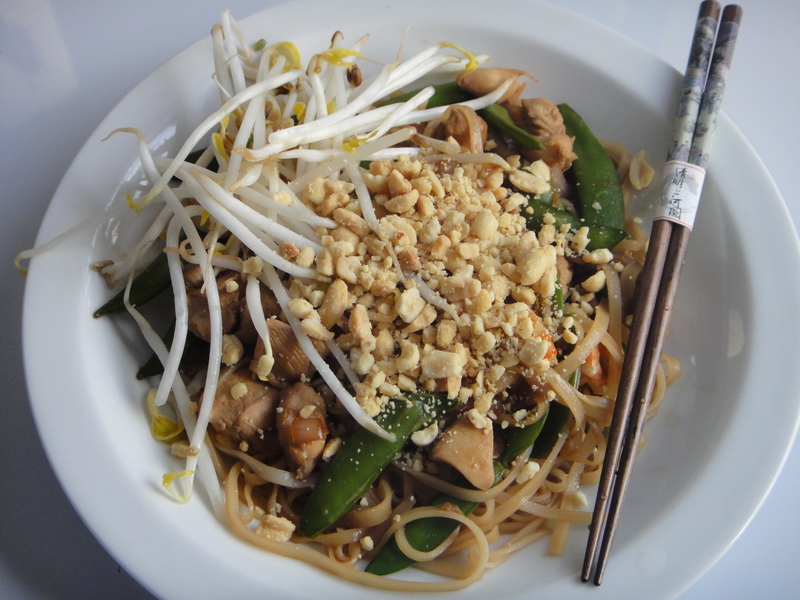 We’ve added some new staples to our recipe box, that have been made several times since the first post, including Pad Thai, Homemade Granola, Apple Pie Steel Cut Oats, Revised Devils on Horseback, Moroccan Spiced Cauliflower and Pistachio Ice Cream. I’ve truly loved creating the past 100 posts for my rock star readers. Thanks for following along with my culinary adventures in my 1950s Parkallen Home Kitchen. Stay tuned for the next 100! Ok everyone, big news: I have a new favourite grain! 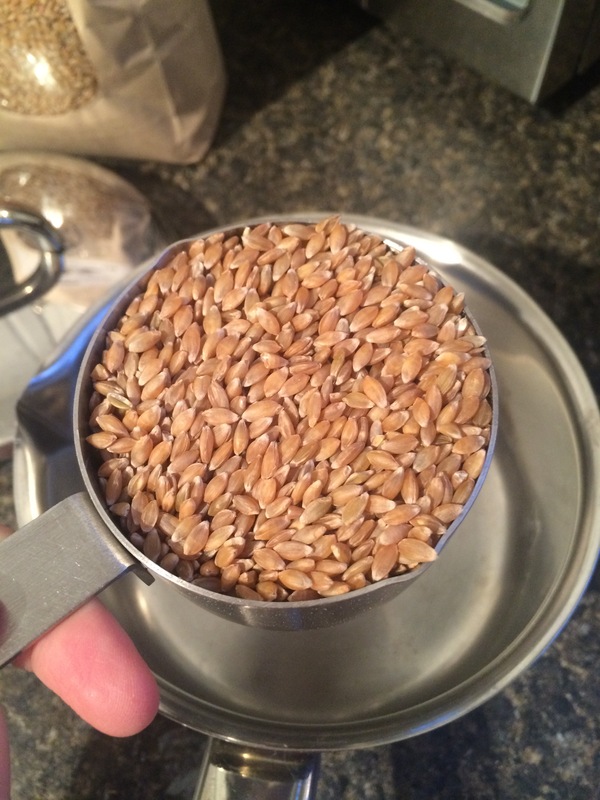 I know what you’re thinking: “Sheesh, Jacquie is in love with her grains…” Why yes, I am. 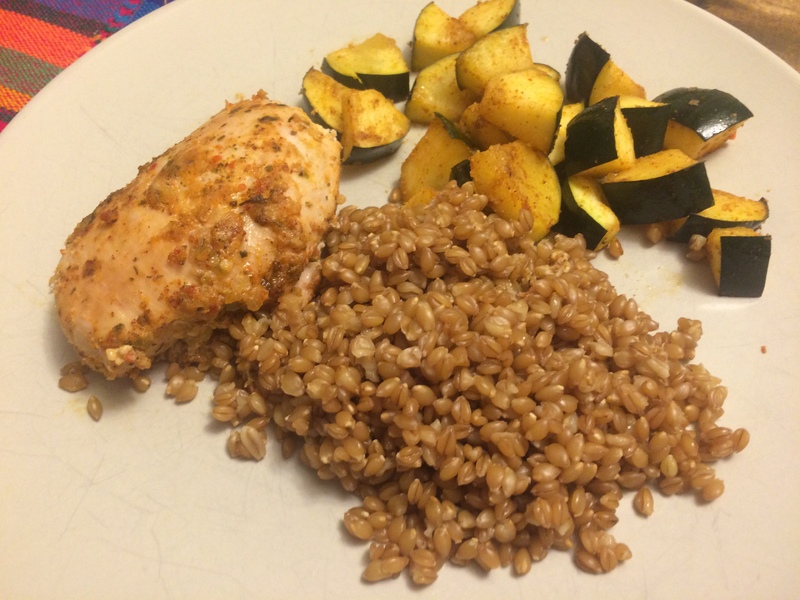 And this one takes the cake on a scale of one to yum: Farro! It’s Gold Forest Grain‘s newest (oldest?) grain, and has an incredible flavour profile. Nutty, earthy and slightly sweet. Oh man, this stuff is good! You can pick up a bag at the Old Strathcona Farmers market. (Seriously, do!) 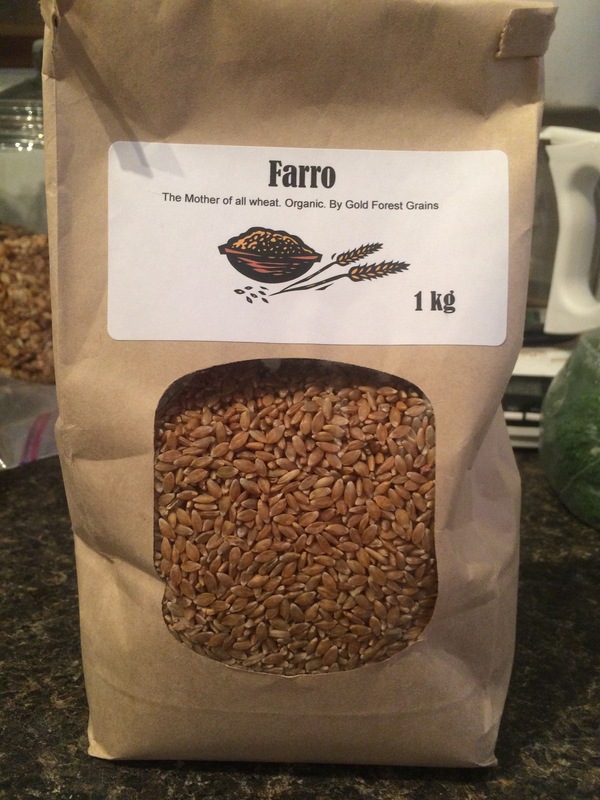 I’ll be doing a writeup with more information on Farro for the Local Good soon. Stay tuned! 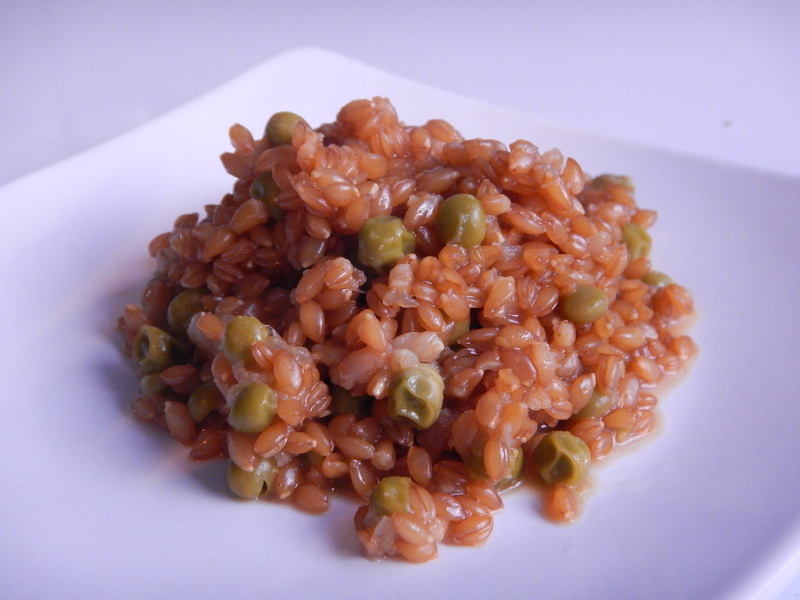 I’ve been using Farro as a side dish for dinner. I’ve already gone through a 1 kg bag of the stuff, and that’s just the beginning! It’s got a nice colour to it, and cooks like barley or wild rice. Here it is, cooked as a side for dinner, with nothing but water, letting the flavours carry themselves. I served it with Cabos lime chicken and Mexican spiced zucchini. This was a winner meal! And then it got me thinking of all of the other things I could do with this rockin’ grain: Risotto, cold rice salads and pilaf. 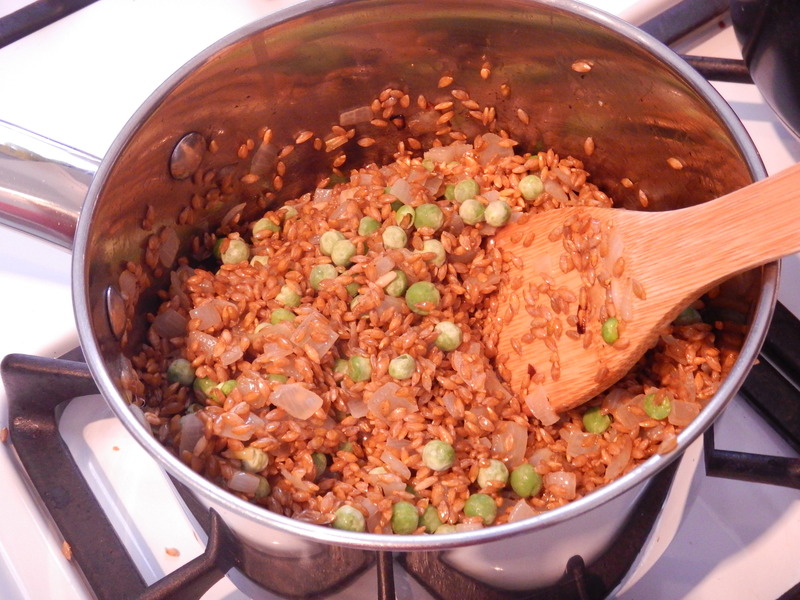 Hmmm, I love pilaf! It was a nice, easy place to start. Begin by melting 1/4 cup butter in a pot. Dice two small onions and brown in the bottom of the pot. 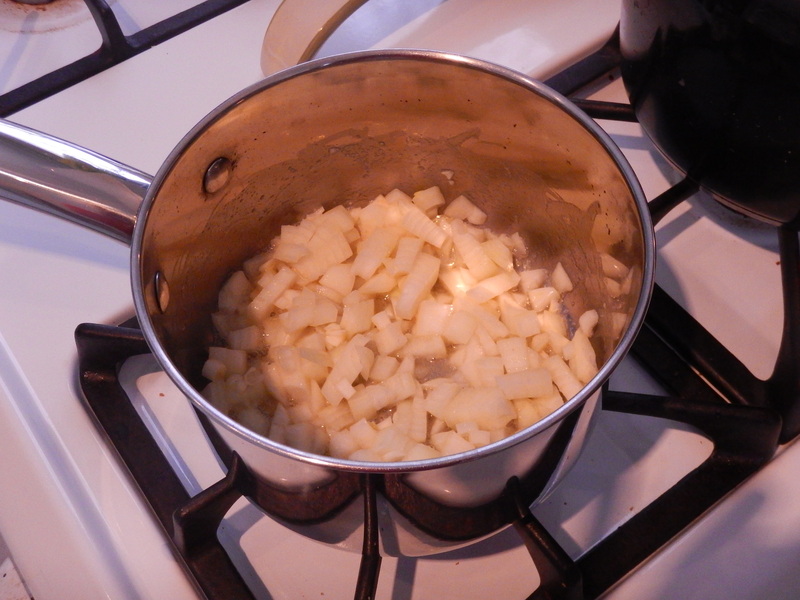 Add the grainy goodness to the buttery onions. And mix thoroughly so that the flavours are evenly combined. 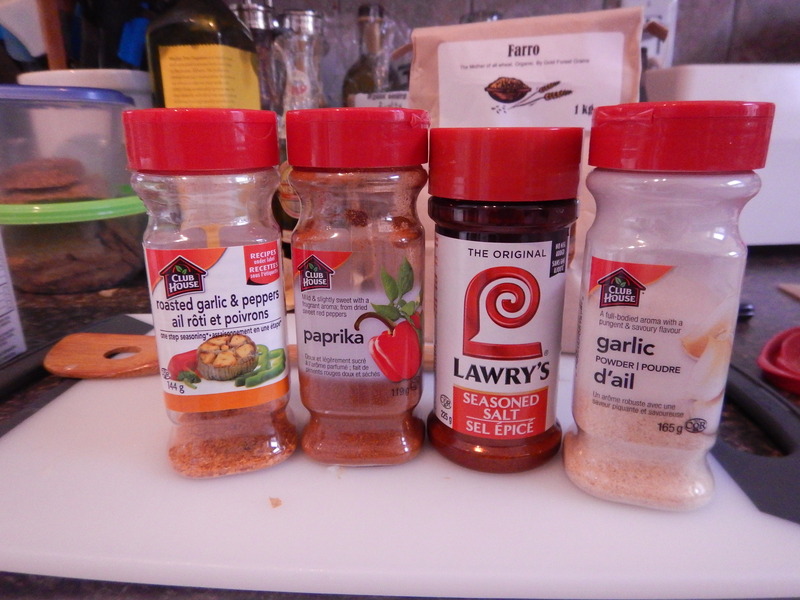 And control them I did: Paprika, garlic powder, roasted garlic and red pepper seasoning and lawry’s seasoning salt (essentially my favourite combination of spices and seasoning!). Add them all to the pot and mix well. Bring to a boil then simmer for about 45 mins, until almost all of the liquid is absorbed and your house smells amazing! Once most of the liquid is absorbed, keep covered and let sit for 5-10 mins, allowing the Farro to absorb even more of the flavour. Serve as a side or as a main topped with a fried egg. Enjoy the rich, gravy-like flavours of this incredible dish. 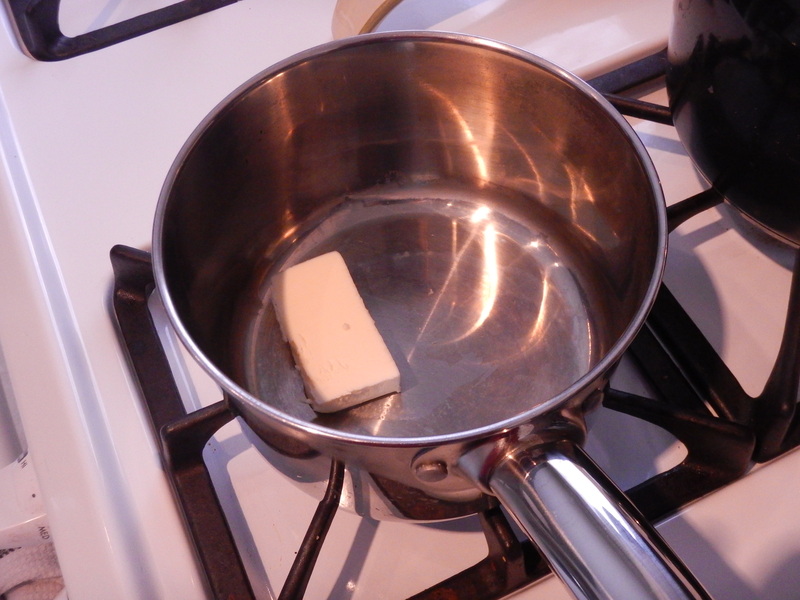 Begin by melting butter in a pot over medium heat. Dice onions and brown in butter. 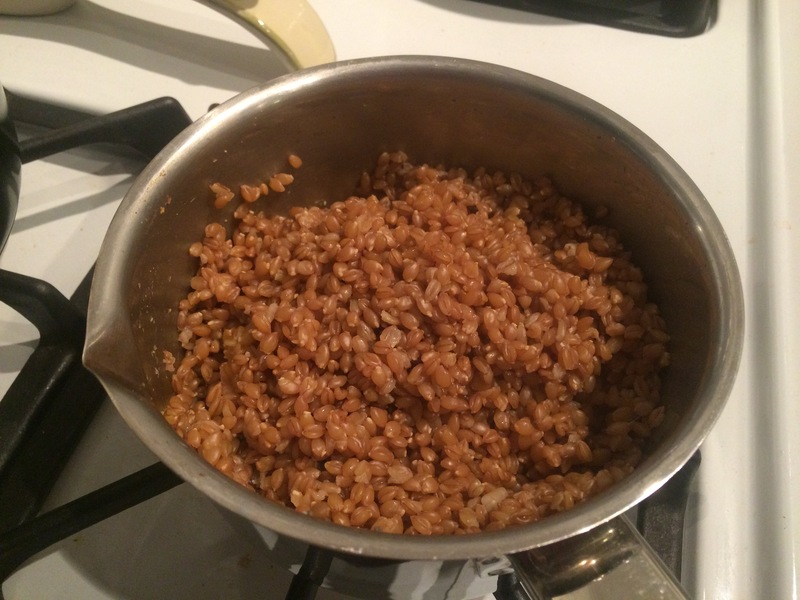 Add Farro and stir well to combine. 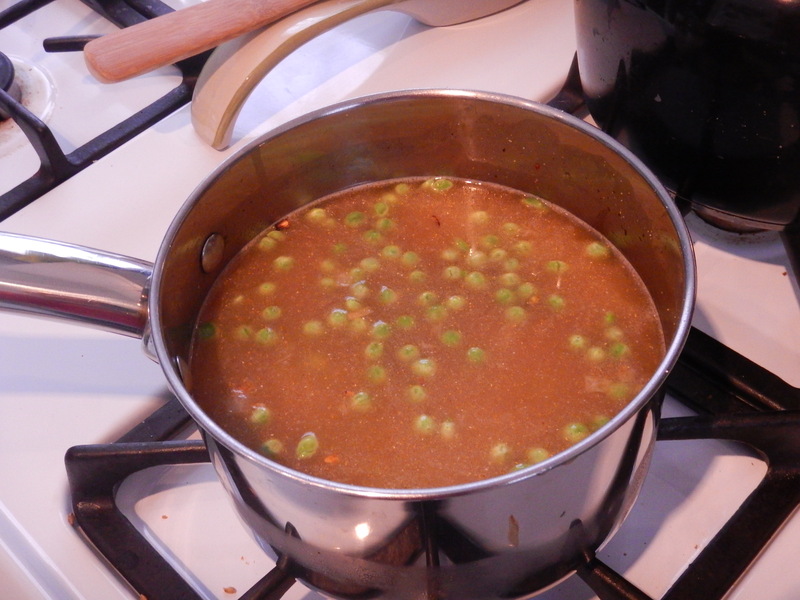 Add chicken stock, seasonings and spices, and peas, cover and bring to a boil. 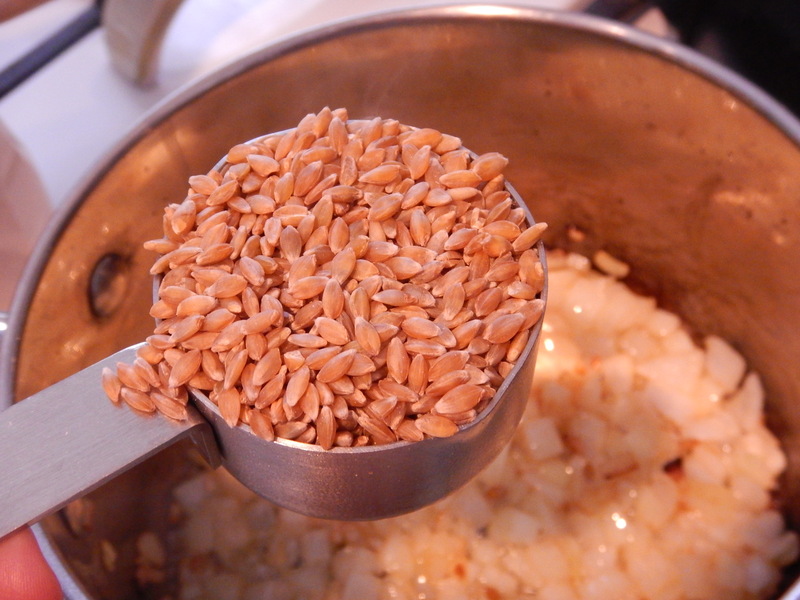 Once boiling, reduce to a simmer on medium-low heat, stirring occasionally, until most (about 90%) of the liquid is absorbed and the Farro is tender (About 45 minutes). Turn off heat and let sit for another 10 to 15 minutes, until all liquid is absorbed. Serve hot as a side dish, or as a main, topped with a fried egg. Enjoy, a lot! I am so pleased to let you all all know, my awesome readers, that I am now a member of the Food Bloggers of Canada. Through this great group of Canadian food writers, I have the opportunity to work with food companies and producers who hope to make their products known to the world. My first-ever opportunity came through the Little Potato Company. 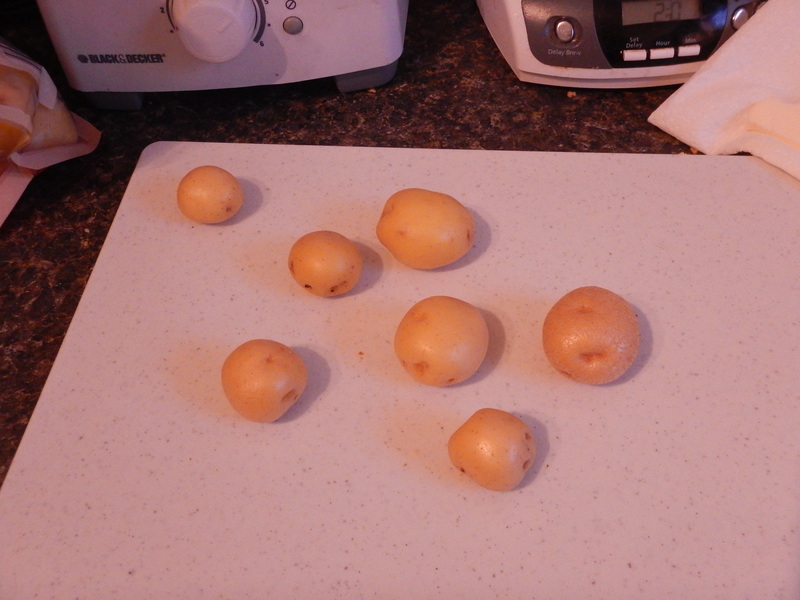 I signed up to write about little potatoes and a few weeks later found an amazing care package of potatoes on my doorstep. How fabulously random and exciting! 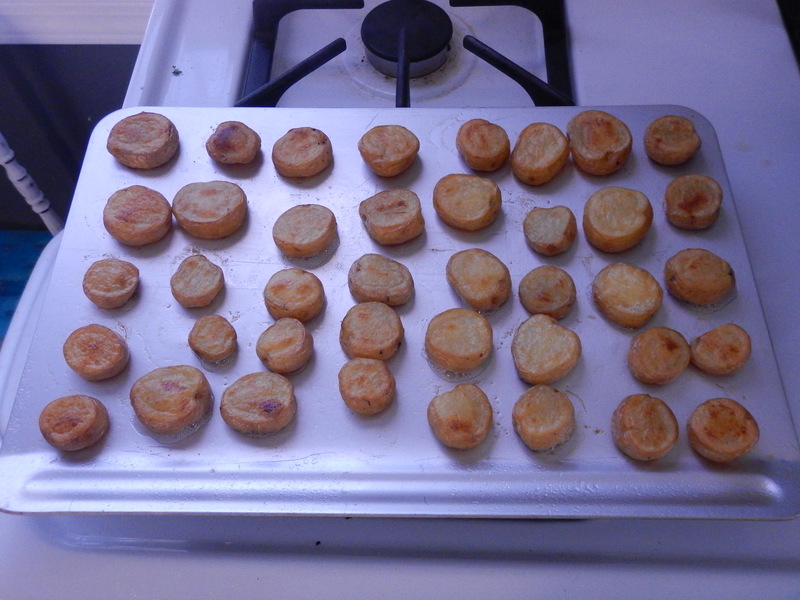 For this recipe, I used the Little Potato Company’s Baby Boomer potatoes. After trying them out on their own for breakfast, I discovered a beautifully fluffy texture to these treasures, that reminded me so much of a baked potato. 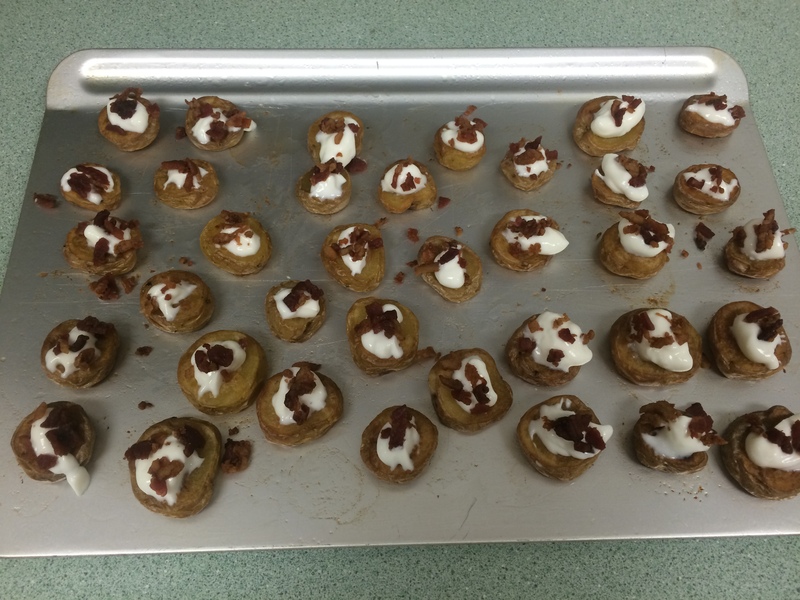 As I had my niece’s third birthday party just around the corner, I thought one bite baked potatoes would be the perfect party snack for little fingers. I started off by greasing a baking sheet with butter. Then I began preparing the little beauties. I lobbed off both sides of the baby boomer to create the perfect, bite-sized round. I placed the mini round on the greased baking sheet. And repeated a couple dozen times. 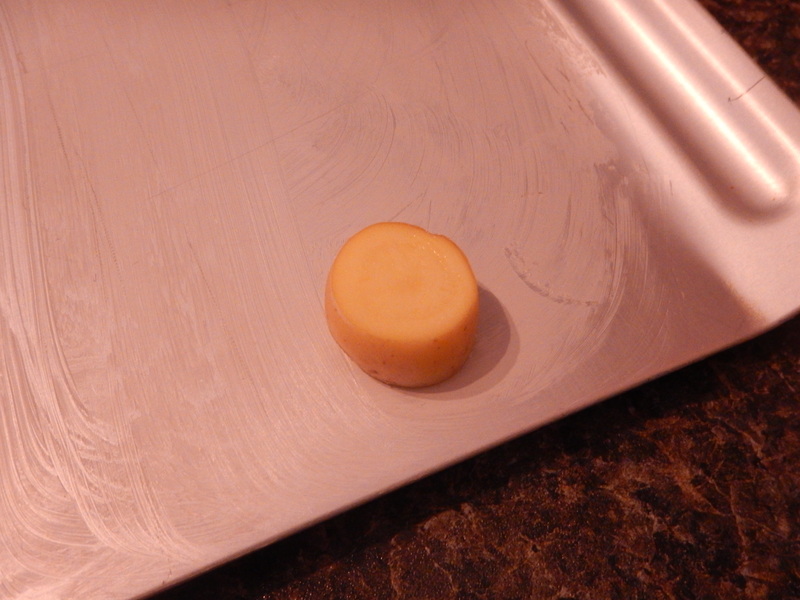 Next step was to brush the other side of the potatskies with butter, to give them a full-on awesome flavour! 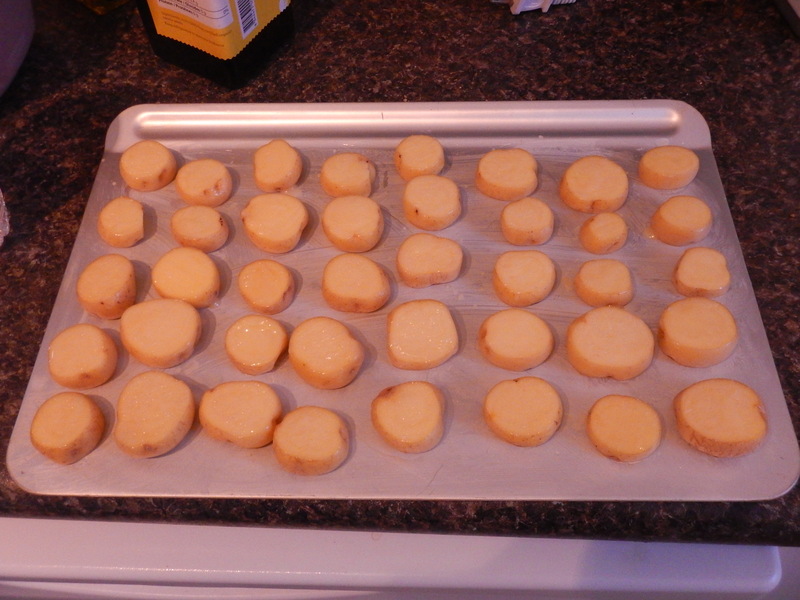 Here they are, all ready for the oven. Bake them at 375 for about 20 mins, turning once. 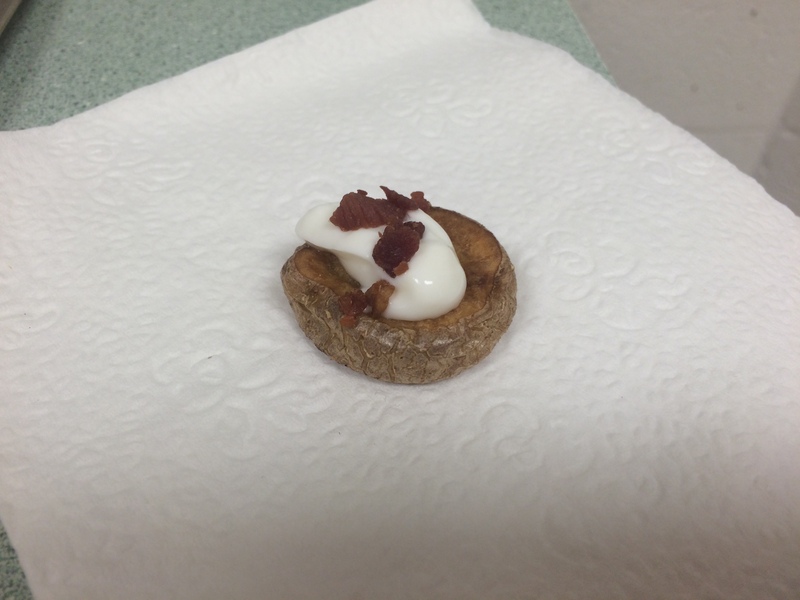 Top with your favourite baked potato toppings (I opted for sour cream and bacon bits!) And enjoy the wonders of a little potato. Preheat oven to 375. 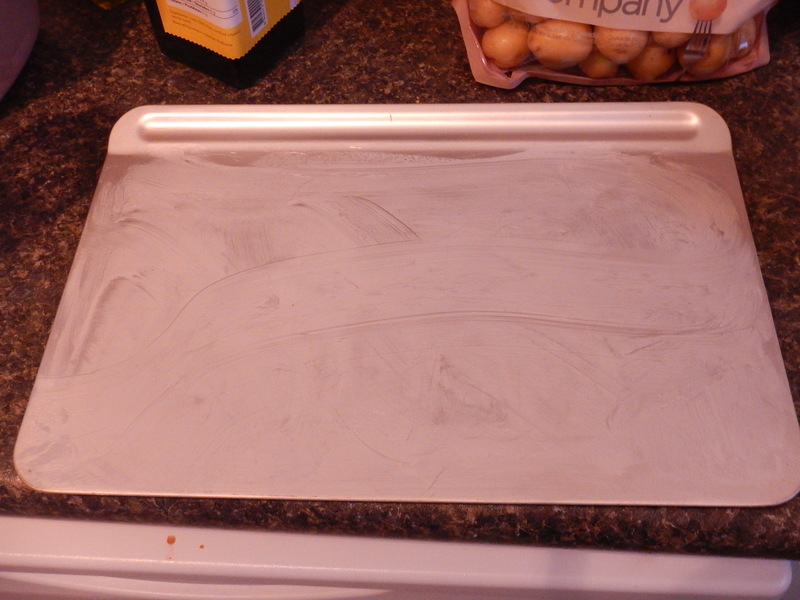 Grease a baking sheet with 1/8 of your butter. 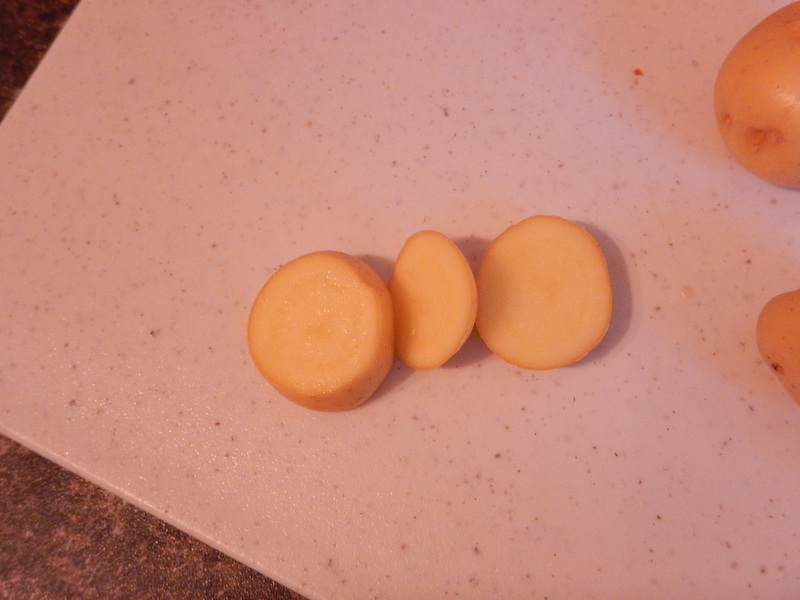 Prepare your potatoes by removing the top and bottom, creating nice little rounds. Transfer them to greased sheet. 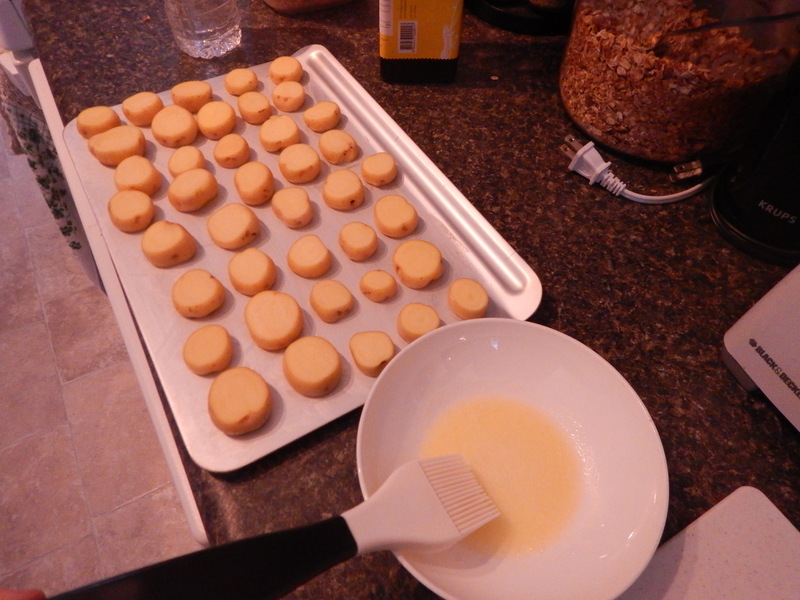 Melt the remaining butter and brush tops of potato rounds. Bake at 375 for 20 mins, turning once, until potatoes are golden-brown on top. If using cheddar cheese as a topper, grate cheese and top each potato with a small amount. 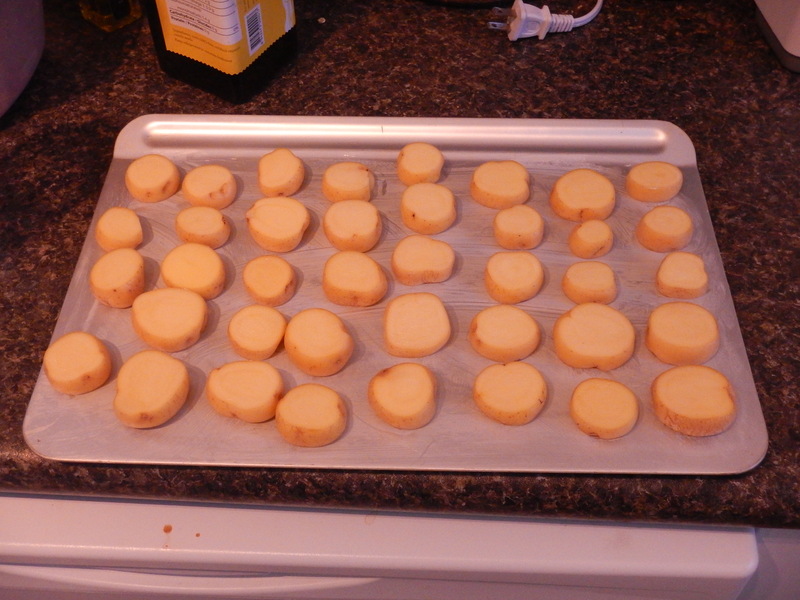 Transfer potatoes back to the oven until cheese is melted. Remove from oven and top with sour cream, bacon bits and chives or green onion (if using). Enjoy as a perfect party or holiday appetizer. Sometimes, you just want to eat a big bowl of pasta topped with thick meaty sauce. 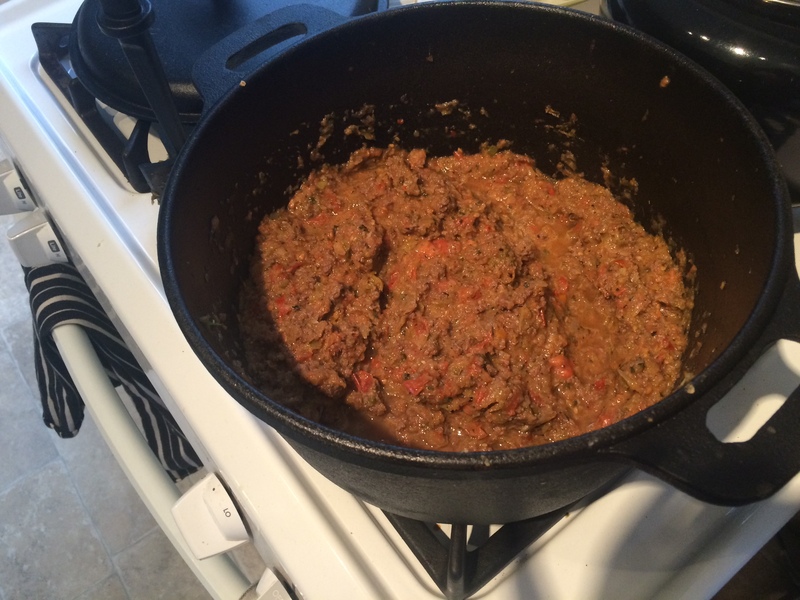 When that hankering comes about, there is honestly nothing better than thick, meaty Bolognese sauce, in my mind. This recipe was pretty cool. It kind of “hid” the veggies into the sauce. I like it! 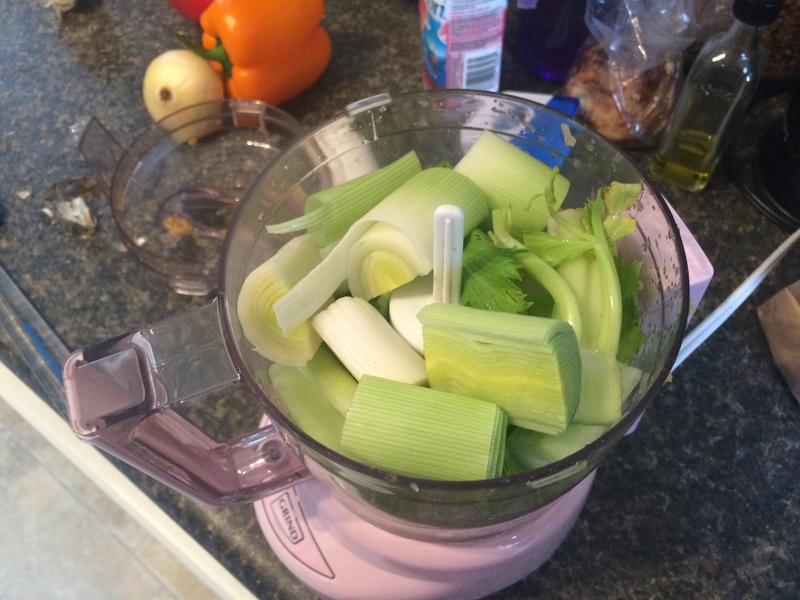 You blend the veggies up using a food processor. 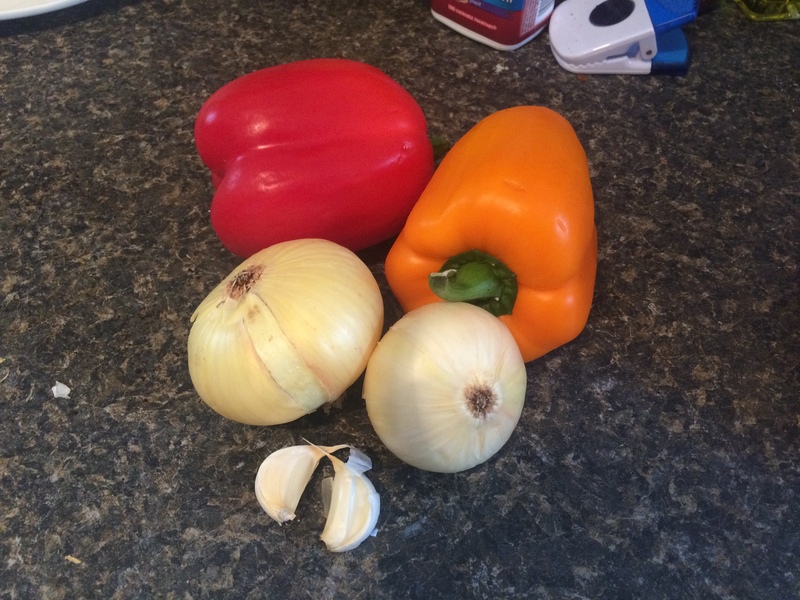 Here are the onions, peppers, celery and garlic. Brown the beef down in a pot, then add the blended vegetables. Cook down together. The recipe called for straight up tomato sauce to add to the mix, but I didn’t have any on hand. 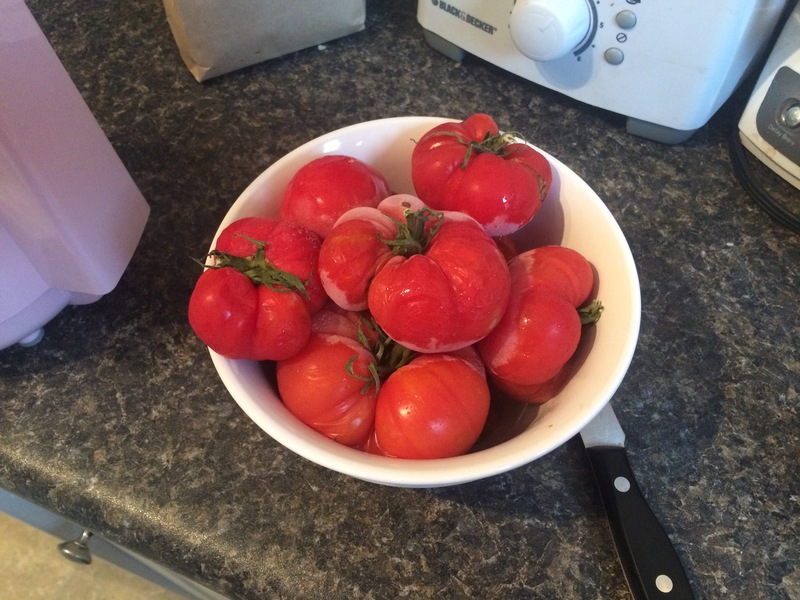 Instead, I used the heritage tomatoes from the garden, thawed from the freezer. I blended them up in the processor and added then to the pot. I know, it doesn’t look the most appetizing, but boy was it ever good! Add a bunch of spices and serve atop a nice bowl of pasta, all covered with cheese. 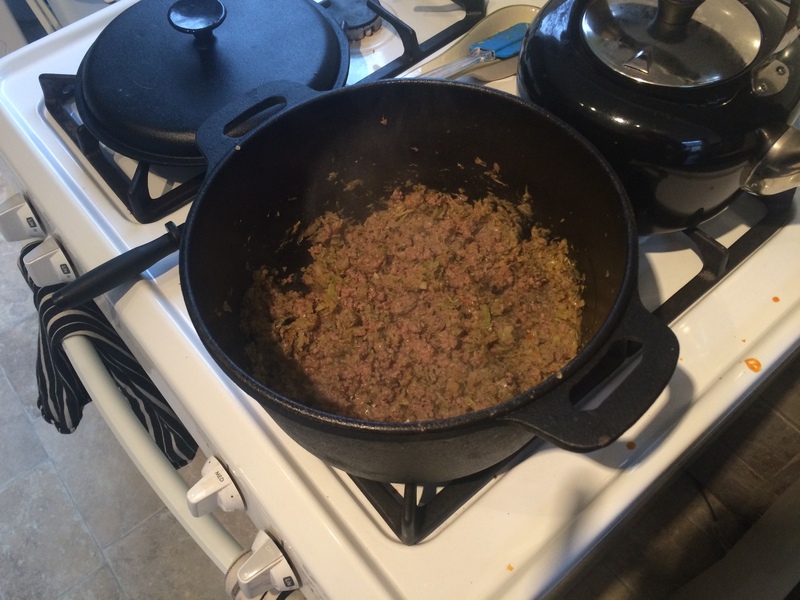 In a large pot over medium heat, brown your ground beef in a little olive oil. 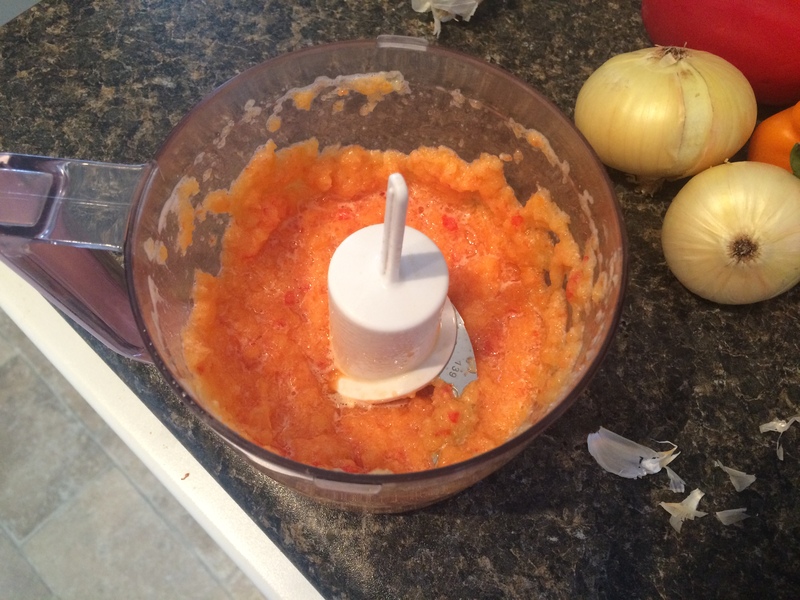 In a food processor, puree onion, peppers, celery, leeks and garlic into a paste. Add the pureed veggies, and cook them down with the beef. Add your tomatoes to the food processor, then add them to the beef and veggie mixture. Cook for another 5 minutes while adding your spices. Once combined, add half a cup of water and simmer on medium-low for an hour, allowing the flavours to combine. While simmering, prepare your pasta. 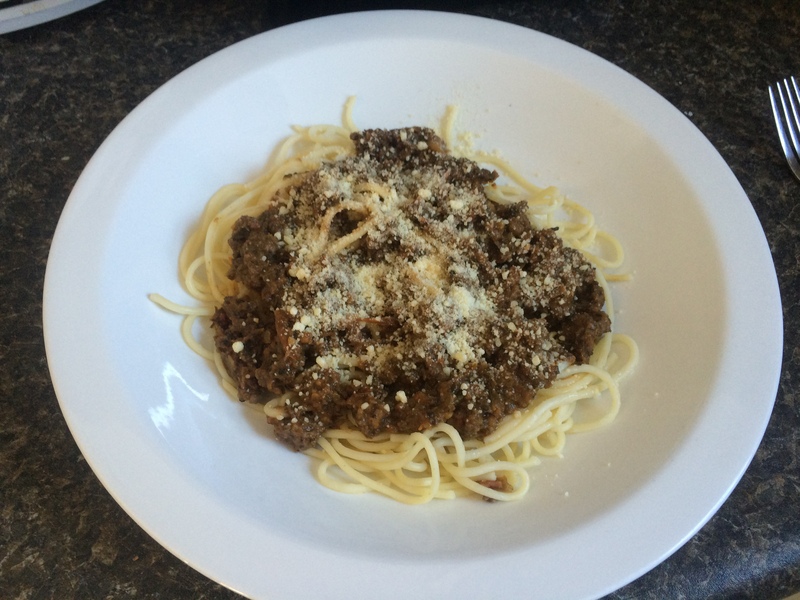 When everything is ready, serve pasta topped with Bolognese sauce, all covered in Parmesan cheese. Hmm!